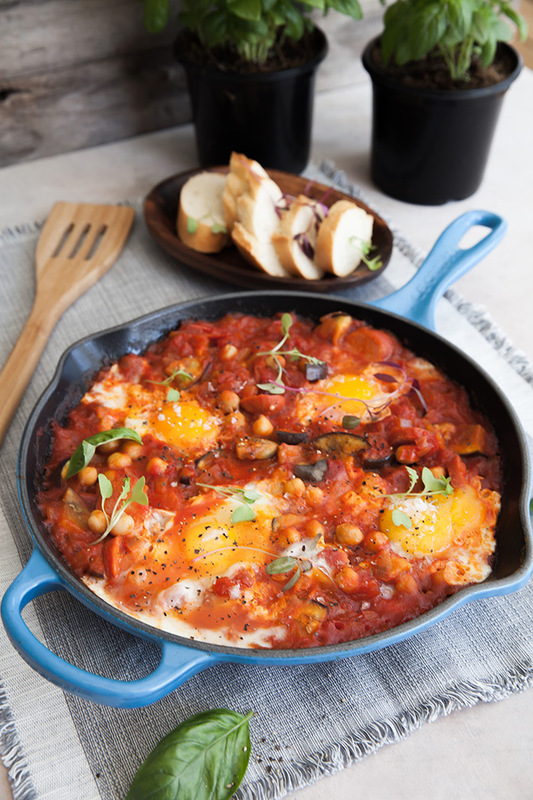 Ever made shakshuka? Well, now is your chance. 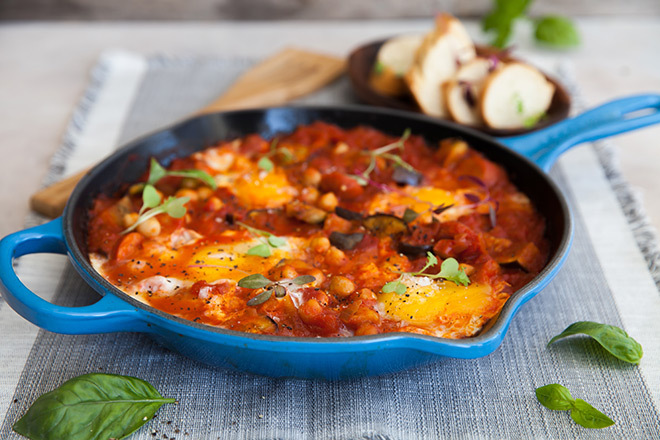 Traditionally a North African/Israeli breakfast dish, this hearty, budget-friendly meal is gaining popularity all over the world (even in London’s upside down dinner scene) thanks to the genius of Yotam Ottolenghi, among others. You can make the tomato sauce in advance or just whip it up quickly with ingredients, herbs and spices that you have in your fridge. It’s really one of those dishes you’ll wonder how you lived without, especially on a chilly weekend and especially if you love slightly runny eggs. 1. Heat the olive oil in a skillet, add the onion and sauté until glossy. 2. Add the garlic and sauté a little more before popping in your tomatoes and a little water. Season to taste with salt and pepper. Cook for 10 minutes or until the tomatoes are heated through. Add a little more water if needed. 3. Drizzle the olive oil over sliced aubergine, place onto a griddle pan and griddle on both sides. Chop up your aubergine and add to the tomato mixture. 4. In another small pan, fry the chorizo until golden on both sides, add the chick peas and sauté until golden. Add the chorizo and chickpeas to the tomato mixture. 5. Make six hollows in the mixture and break each egg into the hollows. 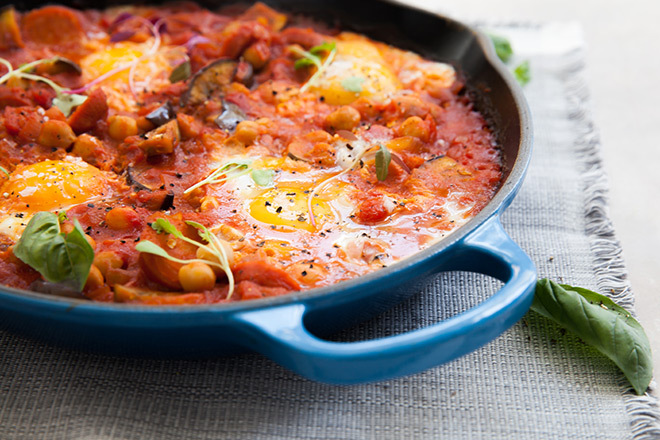 Allow the eggs to cook in the tomato mixture to your liking. Season the eggs with salt and black pepper. Sprinkle with micro-herbs and serve with some warm, crusty bread to dunk into the delicious tomato sauce and perfectly runny eggs. If you love trying out new recipes, be sure to sign up to our newsletter or follow us on Instagram for a daily dose of inspiration.